The finance minister made the announcement in question period Tuesday. OTTAWA — Finance Minister Bill Morneau will introduce the federal government's next budget on Feb. 27 as the country faces persistent uncertainty around trade and competitiveness. But regardless of the fiscal footing, there's agreement that the government should proceed with caution. They want Ottawa to make sure it's ready for the still-unknown impacts of the drawn-out renegotiation of the North American Free Trade Agreement and the U.S. move to slash corporate taxes. "That's a tough twosome to deal with." Last month, the Bank of Canada highlighted the widening negative impacts of NAFTA's uncertain future. The bank not only made a point of emphasizing the potential effects on trade, but also the potential damage on business investment caused by uncertainty itself. Morneau's office has responded to the concerns by arguing that Canada has advantages such as an educated workforce and still boasts a competitive tax rate among G7 countries, even after the U.S. reforms. Ottawa is carefully assessing the U.S. tax changes and will take time to fully understand their potential impacts, his office said in a recent statement. Scotiabank chief economist Jean-Francois Perrault said he doesn't think the corporate tax changes in the U.S. will have a major impact on Canada — but he admits they could. Perrault, who will attend Friday's meeting with Morneau, recommends the government hold off on any big spending plans just in case it needs to respond with tax measures of its own to keep Canada competitive. "It would be very prudent for the government to wait until we see if, in fact, there is evidence that what's happening down south in the U.S. is having a detrimental effect on Canadian business," Perrault said. 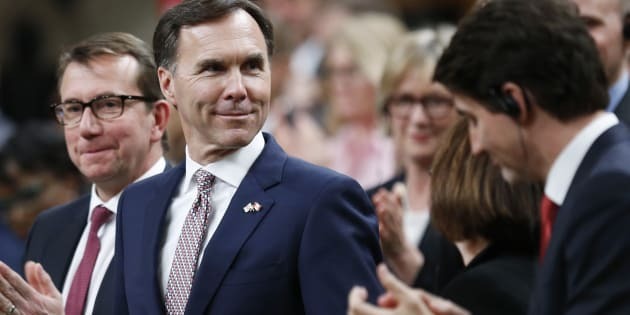 In October, Morneau's fall fiscal statement predicted a deficit of $18.4 billion in 2017-18 and a $15.6-billion shortfall in 2018-19. Porter doesn't think there have been major changes in the government's budgetary outlook since the fall because 2017's surprising strength was largely due to temporary factors. This year, the economy, while still looking relatively healthy, should be a little bit cooler, he added. Craig Alexander, chief economist for The Conference Board of Canada, predicts the deficit to be about $4 billion smaller in 2017-18. "But going forward, they're not going to have a lot of extra money in the kitty for new initiatives if they want to keep debt-to-GDP ratio on a downward path," he said. Following the 2015 election, the Liberal government abandoned pledges to run annual deficits of no more than $10 billion and to balance the books in four years. Instead, it is focused on reducing the net debt-to-GDP ratio — also known as the debt burden — each year. Alexander would like to see Morneau produce a plan to balance the books, while Perrault is less concerned about it as long as Ottawa keeps lowering the debt-to-GDP. Porter would also like to see an effort to eliminate the deficit because Canada is entering a late stage in the economic cycle — but it's not his top priority. "I'm concerned about our tax competitiveness first and foremost, and that's actually where I'd like to see the government concentrate efforts." "We've seen real improvements over the last couple of years for middle-class Canadians — more confidence and among the lowest unemployment rates in the last 40 years," he said during question period. "But there's more work to do, Mr. Speaker. On Feb. 27, we're going to announce the next budget to continue our plan."